Crystal gazing or scrying is a form of fortune telling or divination by gazing into a flawless dark or clear surface to see symbols or images. 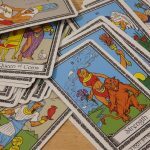 The purpose is to open the third eye and wait until images or symbols appear which can be used make predictions, answer questions, or help with problems being experienced. Although the practice of crystal gazing is not always easy to perform, it can be very easy to learn the technique. When we think of crystal gazing the first thing that comes to mind is a person gazing intently into a clear, natural quartz crystal ball. 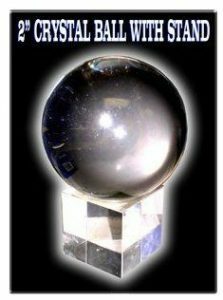 However, crystal balls are not the only way to scry as there are many other materials that are suitable, including glass crystal balls, large pieces of black tourmaline, or clear quartz eggs. For those just starting out, even a black mirror or a dark bowl filled with water and a pinch of salt can be used to learn the craft. In the early stages of learning how to scry you can experiment with a variety of different materials until you find the one that best suits your preference and abilities. Scrying works best in low light so make sure you have an area set aside that is free from distractions and where you will not be interrupted. 1. 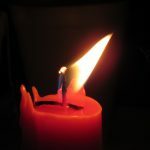 Dim all artificial lights, close the curtains, and light a few candles, placing them behind you to prevent distraction. Burning incense like a charcoal tablet or dried mugwort can help get you in the right frame of mind. It may be helpful to use a recording device to describe what you see while in a stream of consciousness and interpret it afterward. Writing can be too distracting but is also helpful. 2. Sit in front of your chosen scrying object and make sure you are comfortable. 3. Get into a meditative and relaxed state by taking slow, deep breaths and releasing all tension on the out breath, allowing your eyes to relax. There is no right or wrong way, whatever helps you open your mind’s eye and gets you into a meditative state is perfect. 4. When you are in a calm relaxed state, focus on the reflective surface of the object. Continue to gaze into the reflection until you begin to ‘see’ something. This could be anything from colors to clouds, moving mist, or images. Don’t rush or try to force or strain the process. Allow your thoughts to flow freely while you concentrate on anything that may appear. You can also communicate with your personal spirit guides for guidance and ask them questions. The first few times you may not see anything but if you regularly practice scrying with related psychic work, you will get into a relaxed state more quickly and soon you will notice subtle impressions that are the start of bigger things. Once you have mastered the basics of scrying you can experiment with interpreting the symbols or images you see.